Foreign Secretary Philip Hammond has warned the “cumbersome” democratic process of Western governments puts them at a disadvantage in confronting Russia and other threats. Hammond told MPs on Tuesday the UK must get “buy-in” from various sections of society, such as the public and media, during the decision-making process. The Foreign Secretary contrasted this with the “extraordinarily agile” Russian system, which sees decision making power concentrated in fewer hands. His comments came as he expressed frustration over the government’s inability to take military action against Islamic State (IS, formerly ISIS/ISIL) in Syria despite being able to operate in Iraq. Hammond told the cross-party Foreign Affairs Select Committee that Russia had an advantage over Western governments. He said: “Russia has been extraordinarily agile in exploring new technologies like cyber. The Foreign Secretary went on to blame the West’s democratic process for hampering its ability to respond to crises. He told MPs: “We as a nation and as part of an alliance in NATO must think about how we deal with the challenge of our relatively cumbersome decision-making processes. 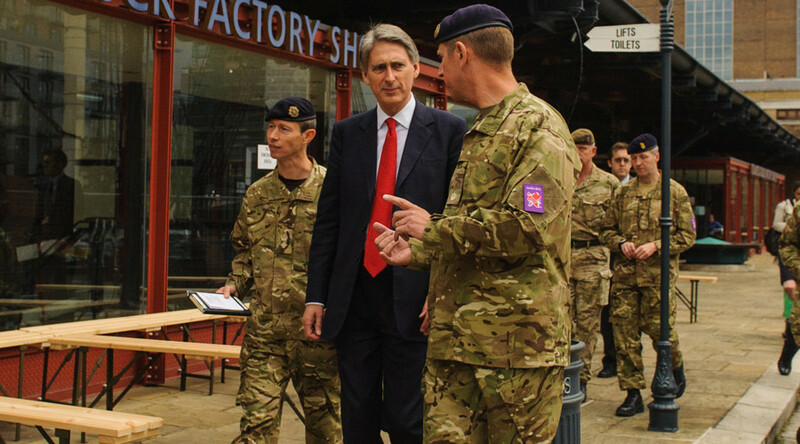 Hammond expressed annoyance at Britain’s inability to carry out military action against IS in Syria, despite being able to launch attacks against them in Iraq. He told the committee: “[We see] Iraq and Syria as a single theatre with a limited set of permissions which stop at an artificial borderline. That is militarily inefficient. A UK surveillance asset that could operate armed is operating unarmed. “It is difficult to see how Daesh [Islamic State] will be effectively militarily defeated without being defeated in its home base of Raqa [in Syria],” he said. Britain’s previous coalition government lost a 2013 vote to intervene militarily in Syria when the House of Commons rejected the motion by a majority of 13. Following the embarrassing defeat, which marked the first time a UK government has failed to gain parliamentary support for a war, Prime Minister David Cameron ruled out British involvement in military action against Syrian leader Bashar Assad. However, earlier this month it was revealed British military personnel embedded with the US armed forces are bombing IS targets in Syria without parliamentary consent. Defence Select Committee Chair Julian Lewis said on Tuesday the secret air campaign undermines public trust in the government. “It is crucial that in these important and sensitive matters the confidence and trust of this parliament is maintained as well as that of the British people.